In a time when so many pubs and bars seem to be jumping on trends and gimmicks in a bid to remain popular, the Northampton Gent has the unbridled pleasure of reviewing a free house that has managed to merge tradition with innovation. Hidden off the beaten track in the Mounts area of Northampton resides The Lamplighter, a popular, award winning hidden gem that every gent should know about. The pub was bought by Landlord Paul Hanna and his brother back in 2009. Having grown up in the trade and with their family having pubs all over London, the pair developed an appreciation for honest, traditional pubs and wanted to create their own. So whilst many a pub were closing their doors during the depths of the recession, the brothers saw the potential of The Lamplighter and decided to take the opportunity to turn it into something special. 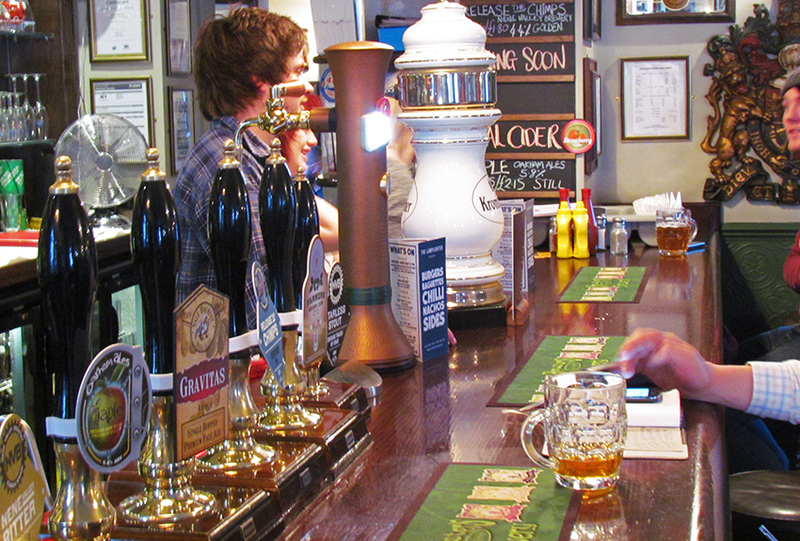 Inside and out, The Lamplighter is the perfect example of a traditional pub. The exterior is subtle and conventional, reinforcing the pub’s overall feeling of no gimmicks. The downstairs interior is exactly what you would expect from a pub that prides itself on tradition, with warm wood furnishings, a wide array of gleaming beer signs and posters covering the walls and a few rich, leather seating options. Stepping inside, it is almost impossible not to feel immediately comfortable with the homely, inviting décor. 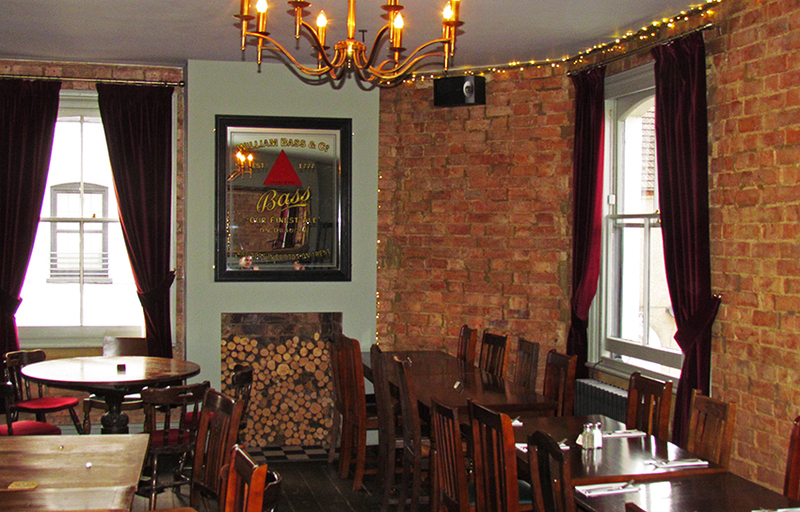 The traditional motif continues upstairs, where the pub has a dining space which is also used for some of the various events that the pub hosts. The Lamplighter also has a wonderful beer garden with a retractable awning towards the rear – essential considering our British weather. A very popular space on weekends and even in the colder months, The Lamplighter’s courtyard also has outdoor heating to ensure the weather does not stop patrons enjoying the outside space. The Lamplighter has one of the best atmospheres amongst all the pubs in Northampton. Always vibrant and welcoming, it is perhaps the most impressive feature of the free house and stands as a testament to the brothers’ dedication to creating a great pub. In the week, The Lamplighter provides a relaxed environment to enjoy food and drinks with friends and hosts a range of events, from comedy nights to book clubs, attracting a diverse and interesting crowd to the pub. These events are often well attended and help expose undiscovered talent. The Lamplighter really comes into its own on Friday and Saturday nights, with the pub always playing an eclectic mix of music either from DJs or bands and being filled to the brim with merry patrons enjoying the pub’s wide selection of drinks. This lively and energetic environment is aided by the staff that are all passionate and friendly. The combination of great music, unique events, a charming setting and an enthusiastic team draws in a good crowd and creates The Lamplighter’s wonderful atmosphere. If brilliant atmosphere is The Lamplighter’s main selling point, then the drink selection comes in a close second. We know as the fine gents you are, you have high expectations when it comes to an establishment’s drink selection. The Lamplighter fortunately fits the bill. The bar attempts to cater for all tastes with real ale, real cider, craft beer and European pilsners on draught; all in a bid to serve patrons the perfect pint. A couple of our stand out favourites includes Krombacher, Pilsner Urquell and Blue Moon which are all on tap. The bar also has a great bottled selection of beers in the fridge and one of the most impressive whiskey and scotch selections we have seen in Northampton. It is this level of dedication to providing a brilliant selection of thirst quenching brews that has seen the pub win its fair share of awards over the years, including being recognised as CAMRA’s Northamptonshire Pub of the Year in 2014. The pub also supports CAMRA’s LocALE initiative and heavily promotes and supports a range brews and microbrewers from close to home and across the UK. The third part of the Holy Trinity is the food. For those gents that have followed the Northampton Gent’s Burger search, you will undoubtedly be aware of The Lamplighter’s burger that blew us away – for those of gents yet to have read the review, check it out. 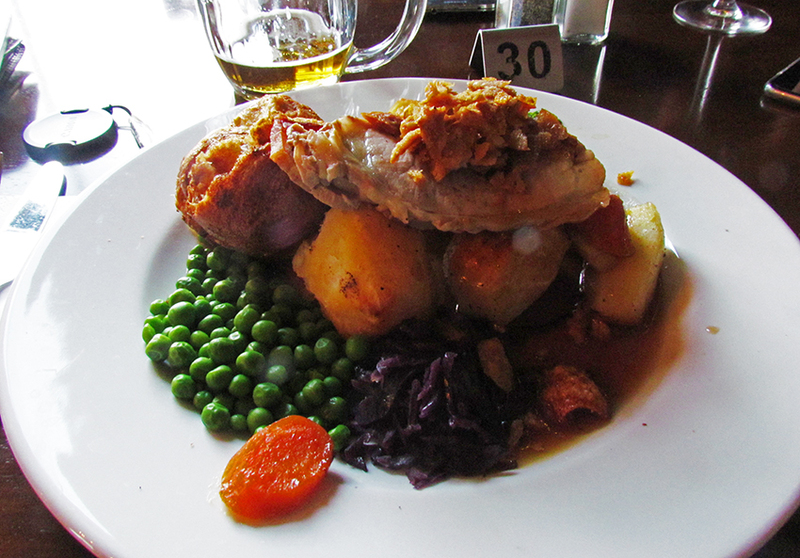 The pub serves honest, classic pub cuisine and has two menus; the main menu and a burger & snack menu. The food continues the theme of simplicity; being cooked to a high standard and is reasonably priced. Serving food until 9pm, The Lamplighter has kept the menu straightforward and uncomplicated with a real focus on using good ingredients. The vegetables were prepared well and cooked slightly al dente whilst the roast potatoes were crispy and fluffy; however the real star of the show was the gravy. Oh the gravy! Rich, meaty and with a consistency you would expect from a pub that prides themselves on their traditional roast; not watery but not too thick. Enjoyed with a merlot, we would highly recommend to any and every gent to pay The Lamplighter at least one visit on a Sunday, with the pub serving roasts until 7pm. 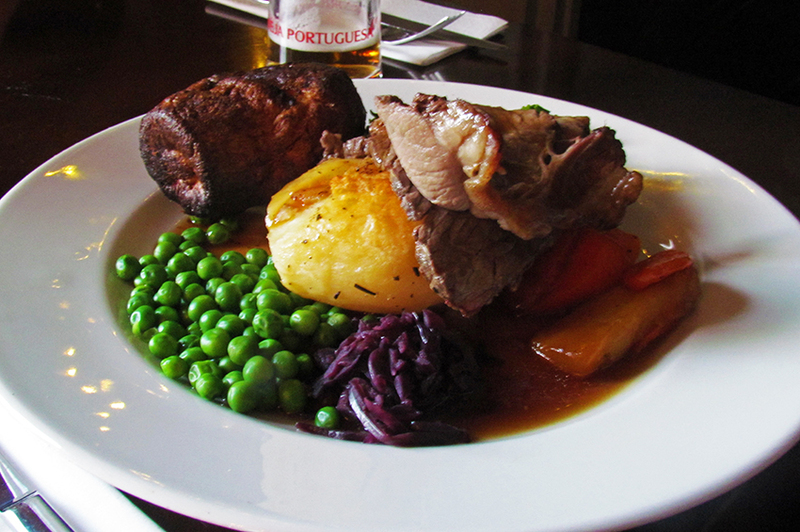 Due to the popularity of the Sunday roasts, we would highly recommend booking reservations in advance. What we found even more incredible was the price, starting at a highly competitive £9.95. After the roasts, we opted for dessert – strictly for the purpose of the review of course – and had the cheeseboard and a chocolate brownie with ice cream. 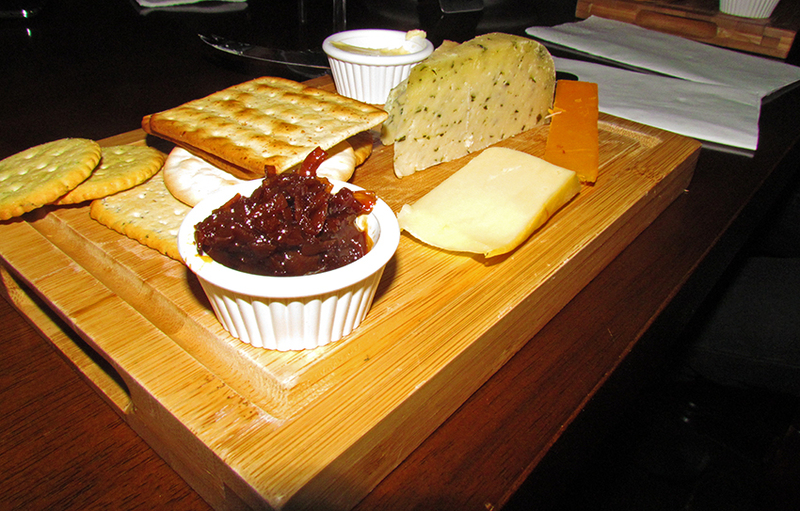 Continuing the local theme, the cheeseboard was sourced from St Giles Cheese Shop on St Giles street and providing an ample range of cheeses and biscuits. The brownie was chocolatey, warm and indulgent, working well the soft, smooth vanilla scoop. As we mentioned, The Lamplighter is a traditional pub with a twist. The free house hosts and organises an array of interesting events, constantly looking to bring something new to lucky patrons. Every Monday is an open mic night; Wednesday is The Lamplighter’s busy quiz night and the weekend sees the pub bring in either live bands or DJ’s playing an eclectic mix of music. Friday and Saturday nights prove popular with a lively, electric atmosphere and good mix of revellers. The pub also runs numerous special events, including book clubs and importantly beer festivals, introducing more real ales and beers than a gent could shake a stick at. The beauty of The Lamplighter really does lie in its simplicity. 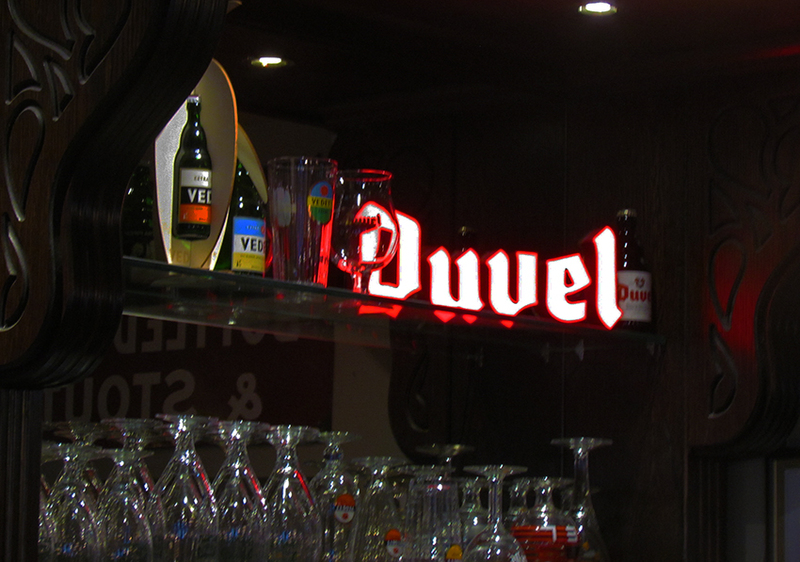 The pub has done an incredible job focusing on three key areas; the food, drink and the atmosphere. Rather than following fads, they have stayed authentic whilst constantly looking to bring new experiences for customers. Uncomplicated, unfussy and filled with charm and character, we can say in all our gentlemanly wisdom that The Lamplighter is one of the finest free houses Northampton has to offer gents. Our recommendation; pop down for a roast or burger and a beer and soak up the atmosphere and we are confident you will not leave disappointed.